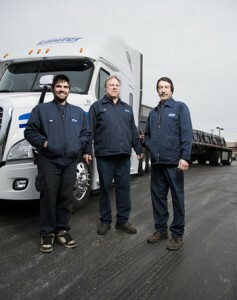 We employ drivers who take pride in themselves and the work they do. We are seeking drivers who care about safety and customer service, and realize that as representatives of the company they are responsible for our success. In turn, our success will be their success. Competitive wages, our drivers have annual salaries ranging from $55,000-$85,000 * see below for specifics on our driving positions. We offer a flatbed training program for current Class A CDL Holders! We will train the right candidate to join our flatbed division. If you are in good physical condition and are not afraid of a little hard work, you can earn a higher salary being a flatbed driver! Check out Andy’s video. Andy joined us after getting his CDL at Waukesha County Technical College and immediately began our flatbed program. He’s been a valuable part of our team ever since. We May Have Part-Time Regional Van Work Available, Depending on Individual Circumstances. Give us a call if you are interested! !